Potassium--I'm Allergic to Bananas--What Should I Eat? Potassium is a mineral that is found in most foods. It helps your body in several ways. Potassium helps to balance fluids and minerals in your body. It also helps your body maintain a normal blood pressure. Potassium helps your muscles contract and your nerves function normally. Potassium is needed by the human body but not in great amounts. Sometimes you are given a drug by your doctor which will cause Potassium to leach from your body-and in my case I get leg cramps that are very painful! When I left the hospital I was given Prednisone (a steroid) to continue at home. Unfortunately Prednisone also makes me retain fluid--a LOT of fluid-my ankles looked like the legs of an elephant and I could barely get my shoes on-not good!! The doctor did an EKG but my heart was fine-so my doctor told me to take a prescription diuretic. Besides the fact that I made a MAJOR mistake and took the pill in the evening----I was up and down all night in the bathroom--by the morning my legs were cramping really bad. I knew what was happening--I went through this once before so I did not panic--just walked the cramp out and hit the WWW. Most people can just eat some banana and that will usually take care of getting the potassium back in your body---but I am allergic to bananas!!! Potassium it turns out can be tricky--you don't want too much or too little and under normal circumstances you get plenty eating as you would normally do. Here is an article on WEB.MD which explains it and gives some suggestions on what foods you should consume. It is short and to the point but well worth the read! Hum, Low Fat Yogurt, Broccoli and raisins are on that list. I saw prunes on a different list as well as a small serving of prune juice. Sweet Potato with the skin--I do love sweet potatoes but I am also diabetic so have to watch carb and sugar content! While in the hospital they managed to raise my blood sugar and weight between the foods they served me and the medicines I was on----------I am not a happy camper. Place prunes in a saucepan and cover with cold water and lemon juice. Cover and simmer on the lowest heat for 20-30 minutes or until soft and much of the water has been absorbed. Serve. The other option is to combine all ingredients and place in the refrigerator overnight (heating not required) and serve cold. As always I suggest you talk to your doctor before deciding you need to do or change anything in your diet!! Whoaaaa! U learn something new every day..! 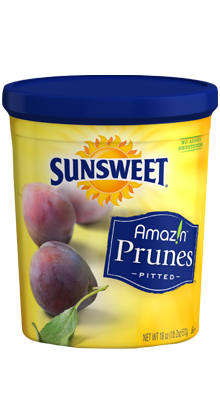 I associated prunes with a rich source pf fiber not potassium. I never knew that prunes was a good source of potassium. That recipe looks yummy too.